Diabetes And Running; A Year In Review | Life, Sport and Diabetes - An everyday look at my life with type 1 diabetes. This year has been a particularly incredible one in terms of my running journey. I've pushed myself beyond what I even knew I was capable of, as I took on completely new running challenges. I've made new friends as a Diabetes Ambassador within the Parkrun community and had the opportunity of taking the message of enjoying physical activity with diabetes around the UK and beyond. This new style of running has challenged the way that I look after my diabetes of course too, so I would reflect that I've learnt a lot during 2017, with this and in supporting others to fulfil their sporting goals and achievements. This year got off to a great start on track, with a bronze medal at the British Universities Championships at the indoor athletics championships in Sheffield. This medal meant so much to me because it was the first time that I'd had the opportunity to run in a team with someone else with type 1 diabetes, let alone stand together on a podium! I then had the opportunity to support the diabetes running community as some brave long distance runners went for a World Record attempt for the most people with type 1 diabetes running a half marathon. This will now become an annual event, along with the physical activity and diabetes conference in Swansea, where the race was held. A few months later, it was then time to support some of the world's greatest athletes as I volunteered for the IAAF World Championships that were held in London. Getting to see some of my sporting heroes race around the track to victory, before having the opportunity myself to run on the Olympic track at Queen Elizabeth Park in the 800m media race. Was an experience that will stay with me forever, as will the memory of the new friendships I formed there. It was onto the 'final frontier' then, also known as Alaska as I enjoyed whale, bear and eagle watching in one of the most beautiful places on earth. Bringing new challenges again to the way that I managed my diabetes from being on a cruise ship floating in the ocean. During this time I was grateful to be able to scan using flash glucose monitoring through my layers of Winter clothing, whilst the Enlite sensors on my CGM helped me manage my diabetes as I discovered all that the great state had to offer. After the indoor track season finished, I continued with my 5km Parkruns which helped prepare me to run my very first 10km race, after 13 years of doing athletics. Many of my friends reminded me (whilst laughing) that as a sprinter, this was something I said I thought that I'd never do. But the running bug has a funny habit of catching hold of you and this was the perfect release from the hard work of studying for my degree. 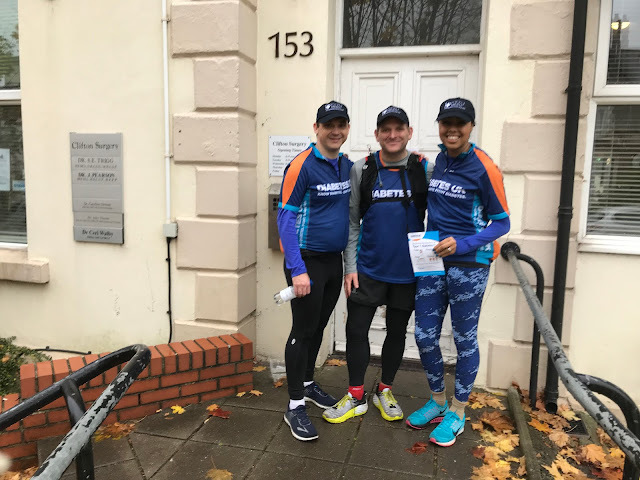 The running bug well and truly took hold then, as a few days after my first 10km run and on World Diabetes Day, I joined Diabetes Specialist Consultant Dr Sam Rice, fellow people with diabetes, Diabetes UK and people from the diabetes pharma community to run around 22 GP surgeries around the city of Cardiff. Covering a distance of 20km (a figure I could only have dreamed of before), we dropped off information packs and tweeted as we went to help raise awareness on the big day. Then it was off to India, for the adventure of a lifetime and also to discover how people live with diabetes on the other side of the world. Of course there have been the lows aswell as the highs of this year. But if having diabetes has taught me anything, it's shown me the importance of resilience, motivation and determination- which are the qualities I spoke about this year as I did talks around the UK on balancing diabetes and sport. Also, as I spent time abroad with other people from around the world with diabetes and it's to each and every one of you that I wish a happy and healthy New Year and a prosperous 2018. With special thanks to all of the brands, companies and communities that I've collaborated with this year, who work tirelessly to make living with diabetes that little bit easier.